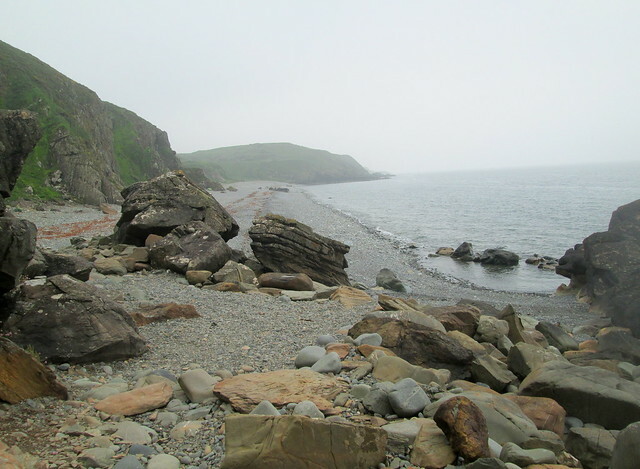 When we were in the county of Dumfries and Galloway (south-west Scotland) recently we decided to visit St Ninian’s Cave which is near Whithorn. 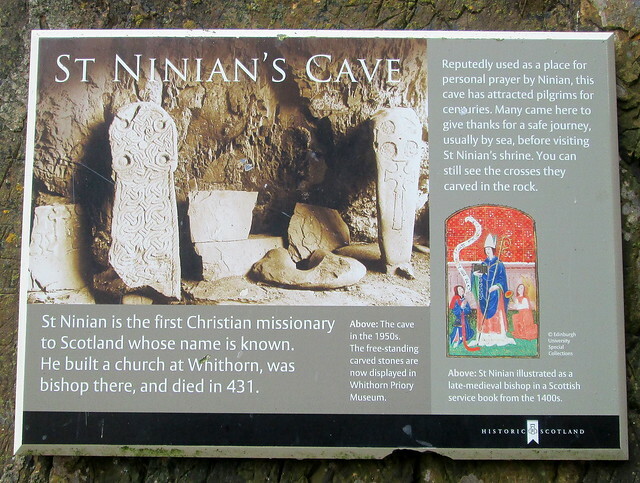 It’s apparently a place that St Ninian – the man who brought Christianity to Scotland way back in the 390s – used for contemplation and prayer. I must admit I hadn’t realised it was quite that long ago. 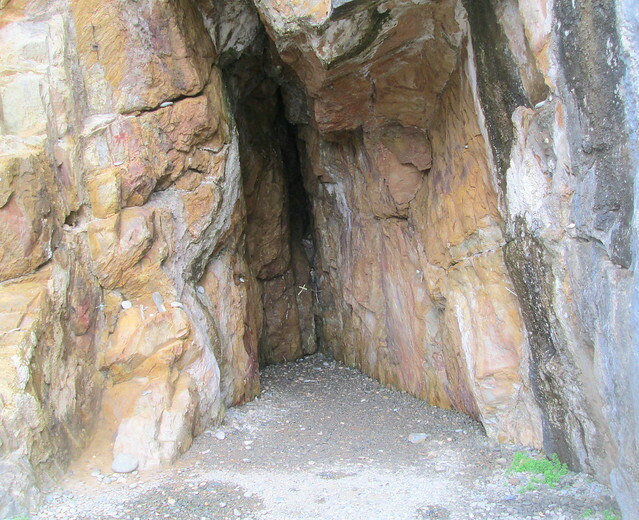 It’s really a very small cave nowadays, but probably over the years it has suffered from rock falls and been eroded by the sea. When we reached the car park for the cave a bus full of school children and teachers complete with guitars had just disembarked. So we decided to race on ahead of them so we could reach the cave before them and sample the atmosphere better. 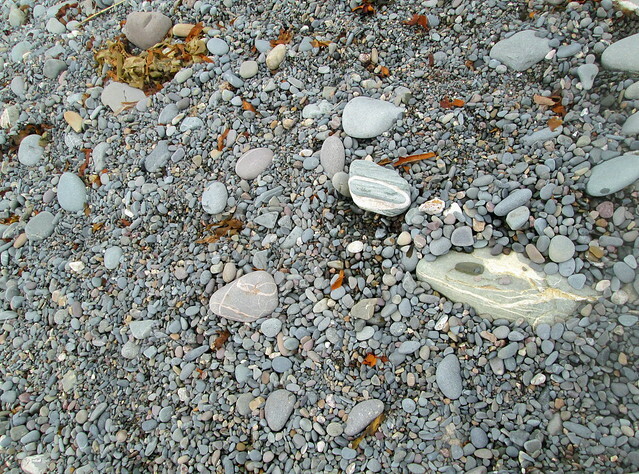 It was apparently a walk of a mile or so, it seemed longer, through woodland before reaching what is a really beautiful beach full of the most interesting and lovely stones I’ve seen on any beach. It was slightly misty though. 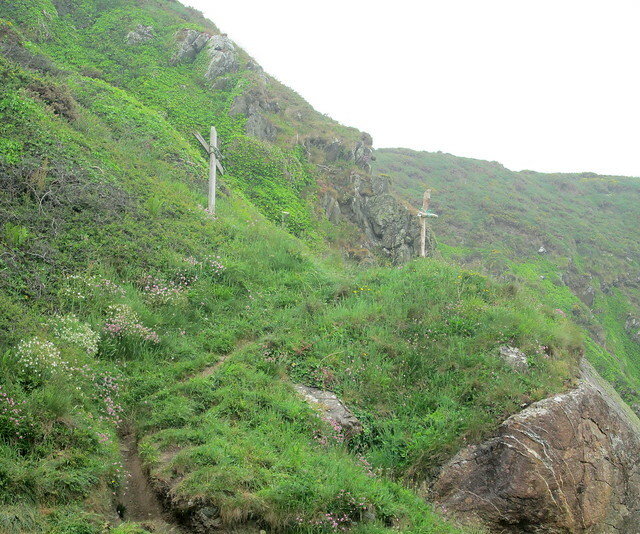 The cave is still a place of pilgrimage for Christians and a lot of home made crosses large and small have been left there, and also flat stones which have been painted with the names of loved ones who are presumably no longer with us. To reach the cave you have to trudge over 400 yards of a beach which isn’t at all easy to walk on, when we left the area the kids on the school trip hadn’t begun to do it. They were being preached to – poor souls. No words were needed, it’s just a beautiful peaceful place. I’m glad we got to it before its atmosphere was filled with Kumbaya, or maybe it would have been Morning Has Broken. I’m not at all religious but this is a very nice place to visit, even on a sea misty day. 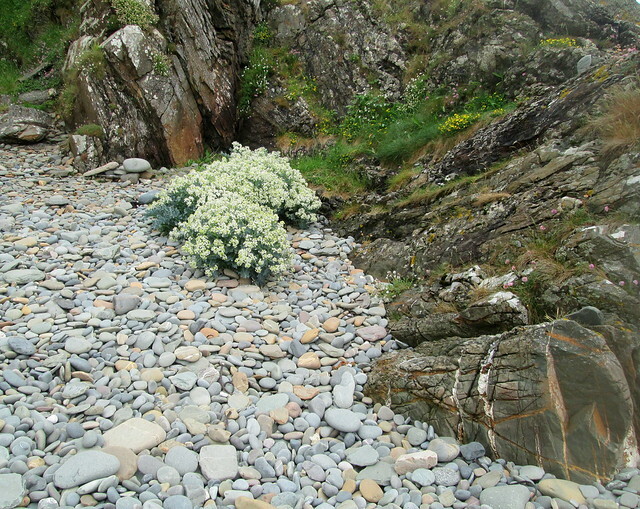 This entry was posted in Coast, Scenery, Scotland, Scottish History and tagged St Ninian's Cave, Whithorn by Katrina. Bookmark the permalink. It looks a spiritual place – irrespective of the crosses and religion in general. Perhaps that’s why Ninian chose it. Very beautiful and contemplative. I’m glad you were able to enjoy it ahead of the school children. And like you, I hope they were given some time and quiet to maybe experience the place for themselves. 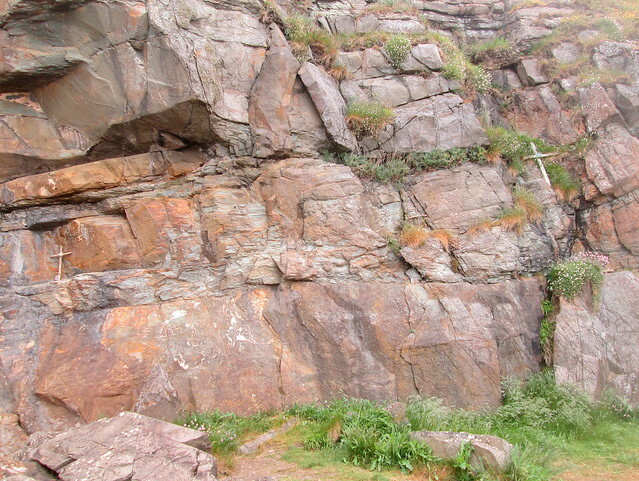 Somehow, I doubt that – children on a school outing = a lot of loud excitable chatter! It is a spiritual place, I think the crosses detract from the atmosphere but no doubt the people who leave them there think differently. Any time away from the classroom is exciting of course – even if you get preached at when obviously they would rather have been able to roam around the beach. What beautiful scenery! I love rocky beaches. They’re so much more interesting than just sand, although sand’s easier to walk on. I love the cliffs and the cave. They are inspiring. Being filled with beauty is a religious experience of its kind, isn’t it? I find sandy beaches quite boring, sometimes you can get a mixture of both sand and rocks which is good as they’re easier to negotiate. At heart I’m a nature worshiper I suppose, it’s always good for the soul if you can get close to nature, and doctors here are beginning to prescribe nature walks to patients, especially in woodland, rather than pushing pills at them.